An attractive real photographic postcard by Snell & Symons of Liskeard, with photography by J H Coath. Trethevy Quoit stands on the south eastern slopes of Bodmin Moor close to the town of Liskeard, and was first described by John Norden in 16101 as "Tretheuie, called in Latin Casa Gigantis, a litle howse raysed of mightie stones, standing on a little hill within a fielde". The quoit stands to a height of about 13 feet. Redding describes his first encounter with "the largest Cromlech now in existence in this Country. The view of it surprises, from the magnitude of the upper stone or slab, and its adjustment upon the imposts; rendered still more wonderful from the supposition that the mechanical powers were unknown at the time it was erected. Older than the inscribed solitary stones of which we have before spoken, and belonging to an order of sepulchral monuments much more complicated in the construction, we become more anxious to acquire the knowledge respecting it which we are at the same time conscious we can never attain." Real photographic postcard by Chapman & Son of Dawlish in Devon. Axford states that "Six blocks of moorstone enclose an area measuring 7ft X 5ft X 8ft 8in high. The capstone which covers the chamber has a hole in one corner. Whether the hole was chipped out by the megalith builders, or whether it was caused by natural erosion, its presence would obviously have facilitated the manoeuvering of this enormously heavy block of granite into position. At the south-eastern end of the monument is a recess or antechamber constructed by overlapping the end stone with the two most easterly of the side slabs. The granite block that has been overlapped and that closes the chamber on this side, has had one corner cut out of it, leaving an aperture through which it is possible to crawl. "2 This view od the quoit shows the fallen backstone. 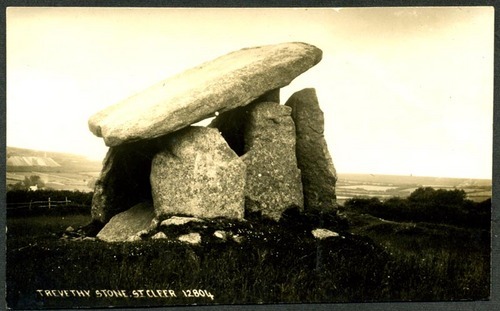 The backstone is likely to have collapsed sometime prior to 1850, when it was described by S R Pattison in that year's Report of the Royal Institution of Cornwall, and Cyrus Redding's 18423 description of the quoit makes no mention of the fallen stone. 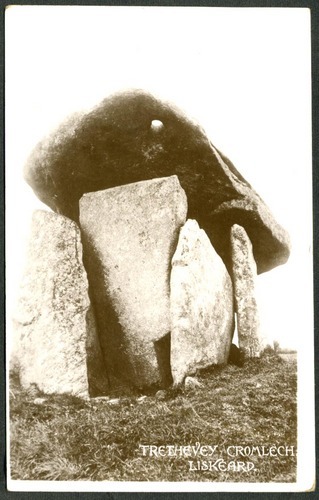 Both Redding and Stockdale, who described the quoit in 18244, assert that the 11 ton capstone was in contact with five of the uprights whereas it now rests on only three, as it did when William Copeland Borlase described it in 1872. It is unfortunate that none of the three views of the monument featured in Redding's book show the rear of the chamber. 1. Norden, John. c.1590s. Speculi Britanniæ Pars: A Topographic and Historical Description of Cornwall with A Map of the County and each Hundred; in which are contained the Names and Seats of the several Gentlemen then Inhabitants; As also, thirteen Views of the most remarkable Curiosities in that County. William Pearson, 1728. 2. Axford, E C. 1975. Bodmin Moor. David & Charles. 3. Redding, Cyrus. 1842. An Illustrated Itinerary of the County of Cornwall. How & Parsons. 4. Stockdale, F W L. 1824. Excursions in the County of Cornwall, comprising a concise historical and topographical delineation of the Principal Towns and Villages, together with descriptions of the Residences of the Nobility and Gentry, remains of Antiquity, and every other interesting object of curiosity. Simpkin and Marshall (Facsimile, D Bradford Barton, 1972).